Q: My horses have Bermuda grass hay in front of them at all times, and I give them a flake of alfalfa in the morning and at night. Are they getting enough vitamins in their diet? A: Access to free-choice forage is important for your horses’ digestive health and prevention of behavioral vices. Alfalfa hay is a good supplement if your horses are worked frequently and need more calories than Bermuda hay alone can provide. Horses consuming plenty of fresh, green grass will not be deficient in any vitamins. 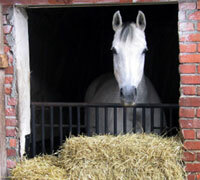 Many areas don’t have pasture available, however, so horses will need to consume most of their daily forage through hay. Hay must be dried, stored and cured before feeding, which quickly diminishes the amount of fat-soluble vitamin A. Horses kept on hay alone will need supplemental vitamin A to prevent a deficiency, which can cause night blindness and other health problems. The other fat-soluble vitamin of concern in horses is vitamin E. This antioxidant is important for proper function of the immune system, and like vitamin A, it rapidly decreases in plant matter after harvesting. Fortunately, commercial grain and ration balancers designed for horses provide sufficient amounts of vitamins A and E (check labels to be sure). The other fat-soluble vitamins, D and K, as well as water-soluble vitamins C and B, are either not required by the horse or are sufficiently synthesized in the horse’s body. Don’t worry if you need to add a bit of grain or low-starch feed balancer to meet all of your horse’s needs. Talk to your veterinarian or an equine extension agent to determine an appropriate menu for your horse. To find your local agriculture extension office, visit /redirect.php?location=www.csrees.usda.gov%2fExtension. This article originally appeared in the March 2009 issue of Horse Illustrated. Click here to subscribe. This article and the links are very informative. I love reading and learning each time I login in to Horse Channels. I agree with you, PKL, all the articles are so filled with information. Some like this one, really make you “think”. My mare is kept on pasture full-time, but I still like to keep informed to make sure she’s getting proper nutrition. Thanks for the info! Just wondering if anyone knows, why “brown mineral salt” is recomented for using in the winter, and the “white salt” for summer.